I continue to obsess over the YouTube Channel, My Wrestling Obsession. New videos of red hot wrestling scenes are uploaded every day. Mostly they’re short clips featuring humiliating Pile Drivers, Sleeper Holds, or in this instance, a nice two-minute video of the Trooper and his devastating Trapezius Nerve Claw which he used to knock opponents out cold. I remember the Trooper by the way and his amazing physique, and yes, it did not take long once he climbed through the ropes and removed his cop uniform shirt. The ref checks the victim's arm like 6 times. The Trooper clamps his powerful grip on the jobber’s neck, and before you know it, the dude is asleep and the ref is checking his arm, picking it up and letting it flop down to emasculate the guy. The ref is named Gary DeRusha — I remember him too and always thought he was cute with his lean body and feathery hair. None of the wrestlers every listened to a word he said. The sleeping jobber is left sprawled out on the mat. I enjoyed this scene because it played around with authority and male power. The Trooper is meant to be a police officer, so he is naturally an authority figure. However, the ref is meant to be the authority in the ring, ordering the Trooper to awaken the wimp. But with big guns like THAT, the Trooper has no intention of obeying the little ref. The one thing they make perfectly clear is that the sleeping jobber has no power at all. First he is put to sleep, then the Trooper stands over him with a foot on his chest (ultimate display of control). 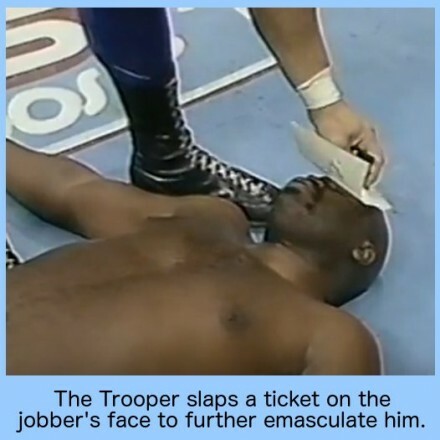 The Trooper sticks a ticket to the chump’s forehead to really make him look like a loser. What is he ticketing this helpless man for — impersonating a Real Man? Another nice upload at the My Wrestling Obsession channel — keep up the great work. Even though these are short little videos instead of the entire match, I am digging them and enjoy checking them out. The Trooper, a combination of amazing muscles and a uniform….what’s not to like?